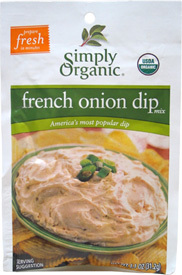 You can now have this popular dip in a dairy-free version – just mix the packet contents with 2 cups of vegan sour cream (or, vegan soy yogurt if vegan sour cream is not available) and in 30 minutes you’ll have a tasty bowl of French Onion dip to enjoy! Made with organic onions and spices, you’ll have a great treat for your next party, or, for just sitting down to much by yourself with a big bag of chips. $1.79 per packet. From brenda king of augusta, Georgia on 5/4/2018 . I always have this on hand. I use it for many different dishes. I add it to soup, sprinkle some (not much)on hash-browns, French fries, baked zucchini, casseroles, chili, mashed potatoes. very good ! it is salty, so use a little at a time when making a dip and taste as you go to get your desired result, a whole package might be too salty for some. This is a great pantry product to keep on hand. From Andrea of Ballston Spa, New York on 3/25/2017 . Who doesn't miss chips and dip, or veggies and dip?? I make this for myself and it lasts all week for dipping veggies for snack time. Just mix with Tofutti sour cream and DONE! Tastes amazing. From Amy of Mesa, Arizona on 12/26/2011 . This made a great dip that you would not have known was vegan if it hadn't been mixed in the tofutti tub. Great for the holidays, or any time! From A. Jean Clayton-Rana of Centerville, Ohio on 11/25/2011 . I used this for the first time yesterday (Thanksgiving), and was really happy with it. One of the things that's tough for a vegan is going to holiday functions and being surrounded by the food that everyone else eats. You have to make sure that what you eat has been cooked separately, using only Earth Balance or other vegan ingredients, eating Tofurkey instead of turkey, etc. That's enough of a challenge, but not insurmountable. But then you go to the veggie tray...something that should be safe...and you can't dip! Because there's always some dairy-based ranch dip in the middle, there. So this time I brought my own. I had a nearly full-container of the Tofutti sour cream, which needed to be used before it went bad. I just went ahead and mixed a nearly full packet of the French Onion Dip with it, and ...yummy! It was nice to be able to partake, and convenient as well. I'll definitely be buying more! From Marjorie Darby of Ajax, Ontario on 3/11/2010 . I like this product and will keep some in my pantry. The mix is rather salty and is quite onion-y. According to the directions, you should mix the dry and wet ingredients, and then let it sit in the refrigerator for about 30 minutes. I didn't wait when I made it, and I suspect the benefit is mostly giving the crystalized ingredients time to disolove, and further permeate the sour "cream". Makes a lot of dip!